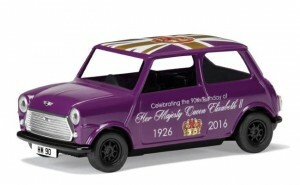 As the Queen celebrates her official birthday on Saturday June 11 we thought we would take a look at some of the collectables and memorabilia available for collectors. These include offerings from Royal Doulton and smaller potteries such as Hazle Ceramics and Bairstow Pottery, teddies from Merrythought & Steiff, cars and buses from Corgi, a great offering from the Royal Collection and more. Merrythought, Britain’s last remaining teddy bear factory, has designed a splendid collectable teddy bear in celebration of Her Majesty The Queen’s 90th birthday, alongside her historic achievement in becoming Britain’s longest reigning monarch. This exquisite piece has been hand crafted in the original workshop in Ironbridge, Shropshire, where Merrythought have been making teddy bears since 1930; a magical place where each teddy bear is brought to life using only the finest material and traditional craftsmanship that has been passed down four generations of the family business. 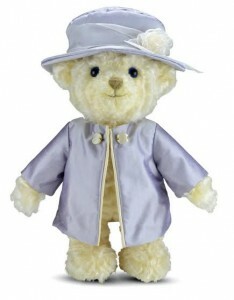 ‘HM Queen Elizabeth II Teddy Bear’ is available from quality retailers, including Harrods, Teddy Bears of Witney, World of Bears and The Merrythought Teddy Bear Shop and website (www.merrythought.co.uk) priced at around £259.00. Steiff have created a special bear for the Danbury Mint to celebrate the event with the Queen’s 90th Birthday Bear which will be issued in a strict limited edition and will only be made during 2016. She is hand-made from the finest peach-coloured mohair, with a hand-stitched nose and mouth, is fully jointed and around her neck there is a regal purple ribbon with a specially-commissioned birthday pendant. Lavishly plated in 9ct rose gold, it shimmers with over 40 diamond-white crystals. There are also two sparkling pear-cut amethyst-coloured stones and a genuine solitaire diamond – the Queen’s birthstone. The bear’s paws are embroidered in majestic purple thread with the words “Queen Elizabeth” and the year “2016”. The bear measures 11″ (28cm) standing, and is priced at £199. 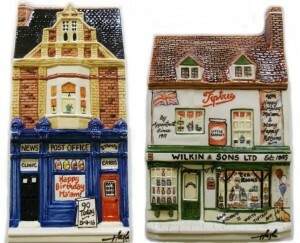 Hazle Ceramics still produce some of the best collectables from their pottery in Essex. They are able to create special pieces for many special events and if you have not heard of them visit http://www.hazle.com. The models are The Post Office – Happy Birthday Ma’am! (priced at £54) and The Queen’s Birthday Breakfast (priced at £110). 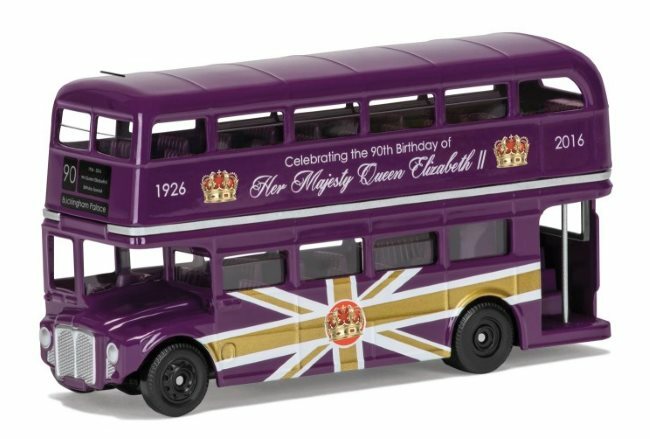 Corgi are celebrating the 90th Birthday Of HM Queen Elizabeth II with two special commemorative die-cast vehicles: a Routemaster bus and a classic mini, both in regal purple livery. 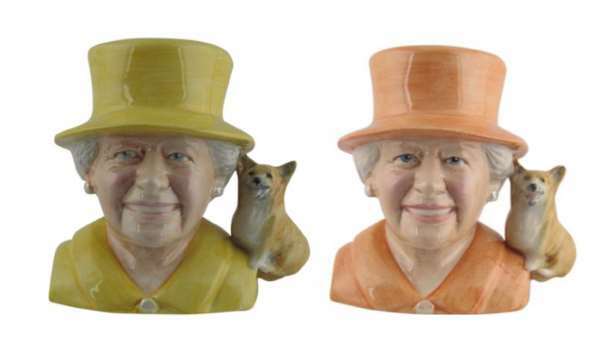 Both models are priced at £9.99 and can ordered from the Corgi web site. A special edition Classic Mini in regal purple to celebrate the 90th Birthday of HM Queen Elizabeth II. A special edition Classic Routemaster in regal purple to celebrate the 90th Birthday of HM Queen Elizabeth II. 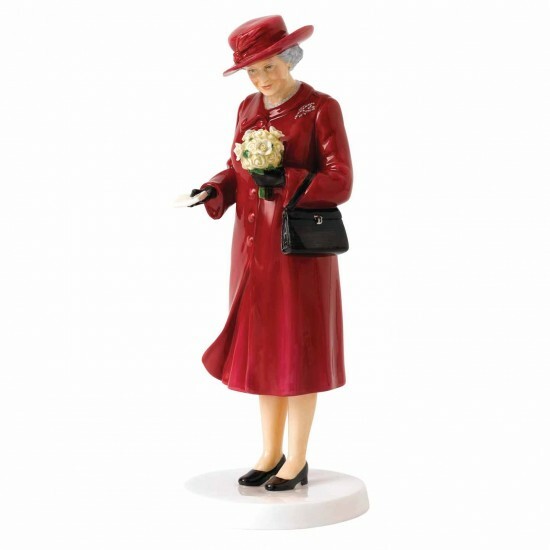 Royal Doulton have created a series of four figurines Celebrating Queen Elizabeth at 90. The models are: Celebrating Queen Elizabeth at 90: At Home, Celebrating Queen Elizabeth at 90: Birthday Celebration, Celebrating Queen Elizabeth at 90: A Royal Christening and Celebrating Queen Elizabeth at 90: Army Days. Each model is 22cm high. 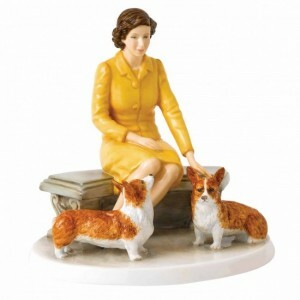 Queen Elizabeth in a striking yellow suit with the Royal Family’s recognisable corgis at her feet whilst relaxing at home. Masterfully crafted and rendered in beautiful colours, this is a stand-out piece to honour Her Majesty the Queen’s landmark birthday and her 63 years of service in the Royal Family. Standing at 22cm tall and rendered in a vivid deep red to her coat and hat, Queen Elizabeth is portrayed here with celebratory birthday flowers and her iconic sense of style. Every detail has been considered and executed with fine craftsmanship for a collectable to last a lifetime and beyond. 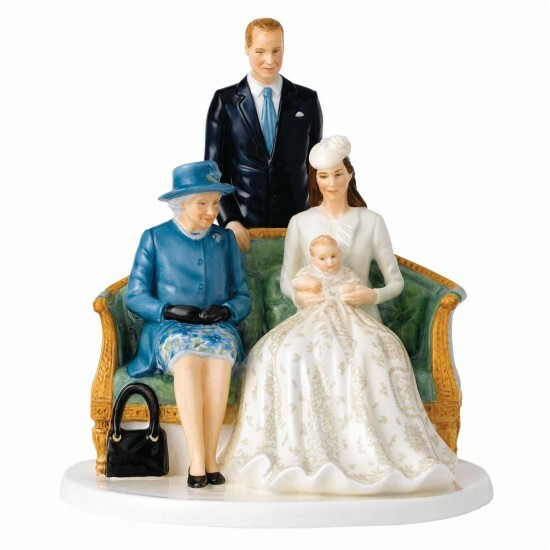 A scene paying tribute to Prince George of Cambridge’s christening, this impeccably crafted figurine depicts a scene set up for official photos of the day – showing Her Majesty the Queen with the Duke, Duchess and Prince of Cambridge sitting on a sofa that would have been within the regal surroundings of Buckingham Palace. Rendered in beautiful colours with striking attention to detail, this piece would make a beautiful gift for any home, and a highly desirable collector’s piece. 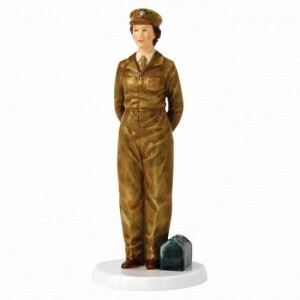 This commemorative figurine displays Queen Elizabeth in her days within the army after she joined the Auxiliary Territorial Service in 1945. Presented in bold time-honoured colours with impeccable attention to detail, Queen Elizabeth is shown with her correct uniform and bag. Keep as a treasured collectable or give as a superb gift. The Royal Collection shop has a whole range of of commemorative chinaware and gifts commissioned by Buckingham Palace. The collection includes a Commemorative Pillbox, Mint Imperials, Plates, Tankards, China, Carriage Clock, Mugs, Jewellery etc. Bairstow Pottery, of Stoke have released a commemorative Queen Elizabeth ll character jug to celebrate her 90th Birthday. The Queen Elizabeth ll 90th Birthday Commemorative Character is being produced in a number of colourways including yellow, orange and blue version.